When made with boneless duck breasts, Duck a l’Orange is an exceptionally easy, yet elegant entrée to serve for a special occasion. Remove the duck breasts from the refrigerator 30 minutes ahead to allow them to come to room temperature. Being careful not to cut into the meat, score the skin on each duck breasts in a crosshatch pattern at 1/4-inch intervals. Season both sides with salt and pepper. Zest the orange into a small bowl, then trim away both ends. Following the curve of the orange, carefully cut away the remaining peel down to the flesh, then trim any stray bits of the white pith. Using a sharp knife, carefully slice along both sides of each membrane toward the center of the orange to remove the segments (these are called orange supremes). Set aside. Place the duck breasts, skin side down in a heavy frying pan over medium heat (about 275°F) to render the fat. You should see the fat begin to melt and hear a slight sizzle. If your duck breast is cooking harder than that, lower the heat. Without turning, continue cooking the duck until the majority of the fat has rendered from the breast and the skin is golden brown and crisp. This usually takes 10 to 15 minutes. While the duck fat renders, make the sauce. Whisk the cornstarch together with 1/4 cup of the chicken broth in a small bowl and set it aside. In a small saucepan, melt the butter over medium heat. Add the shallot and sauté until soft and fragrant, 2 minutes. Stir in the sugar and cook until dissolved. Add the sherry vinegar, orange zest, orange juice and remaining chicken broth. Raise the heat and bring the mixture to a boil. Give the cornstarch mixture a quick stir, then add it to the saucepan and cook for 30 seconds. Reduce the heat and simmer, whisking constantly, until the sauce has thickened to a syrupy consistency, 2 to 3 minutes. Season the sauce to taste with salt and pepper, remove from the heat and add the bitters. Cover to keep warm. Once the duck skin is crisp, turn the breasts over, raise the heat slightly and continue cooking until an instant read thermometer inserted into the thickest part of the breast registers 130°F for medium-rare (or 140°F for medium), 3 to 6 minutes. Allow the duck breasts to rest for 8 to 10 minutes before slicing. To serve, arrange slices of duck and several orange supremes on each plate, then drizzle the sauce over the top. 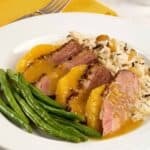 We recommend serving Duck a l’Orange with simple side dishes like a medley of white and wild rice with toasted almonds and oven-roasted green beans.